Time to “buy the Dip”? 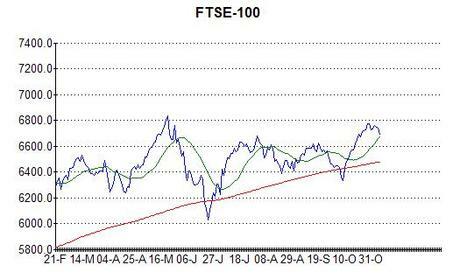 The FTSE has fallen below its 20 day moving average today (20dma – the green line) which, if I am right about it being at the start of a new bull run, would be a good time to get into the market. During an upswing the index tends to sit on top of the 20dma, dipping below only occasionally, so there should be a good chance of today being the low for a few weeks. Given how far the market has risen in the last four and a half years and how expensive the Dow is already looking, if the 440 point gain we saw last month is the first leg of a bull run, I suspect that it will be the final blow-off before the sovereign debt crisis comes to a head and the markets finally crash. The US non-farm payroll number for last month is out at 1:30pm today and, ordinarily, this can move the market. No one knows how much this number will be affected by the government shutdown though, so I think it might be difficult for the market to read the usual significance into it and there may be little reaction. A Plethora of “death Crosses”! FTSE Teetering on the Edge? Bitcoin is Looking Wobbly Again. Is Bitcoin About to Bounce Again?